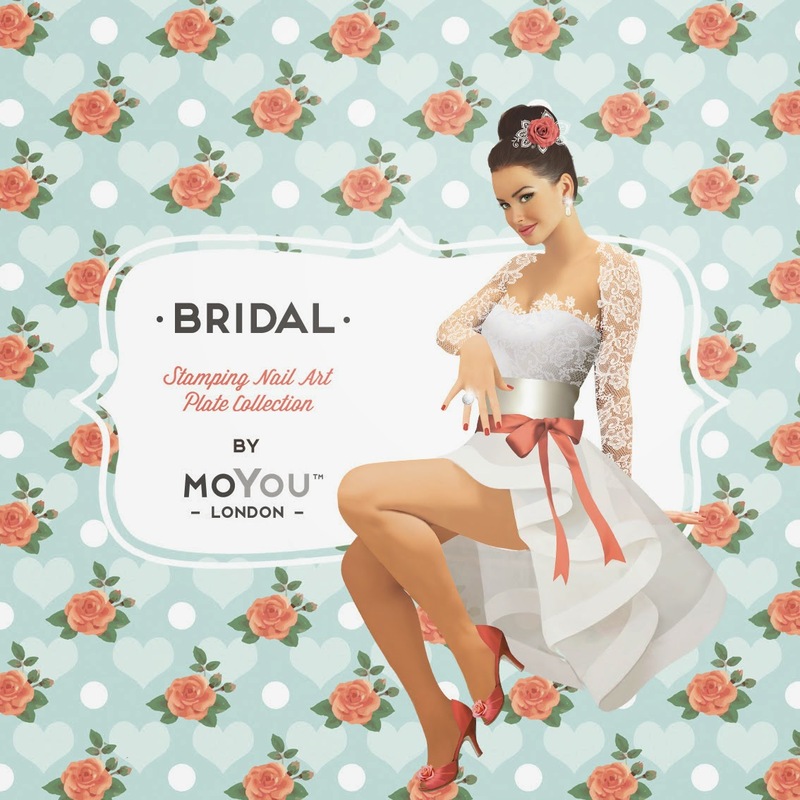 Lacquer Lockdown: Hot Off the Stamping Press: MoYou London Bridal Collection Expansion! 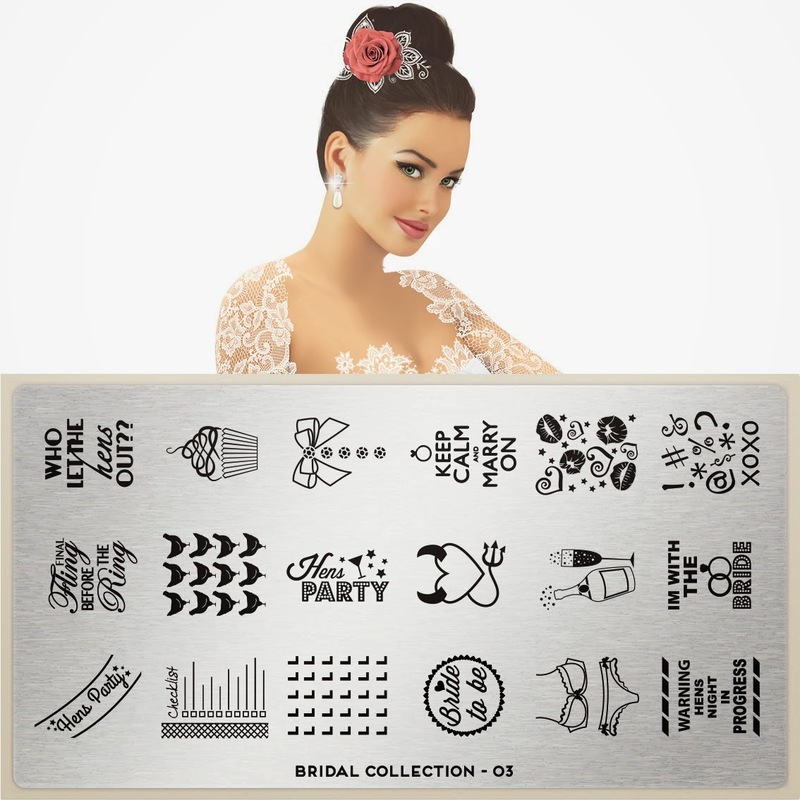 Hot Off the Stamping Press: MoYou London Bridal Collection Expansion! For those of you who don't know MoYou London released a new collection last week called the Bridal Collection consisting of 4 new plates. These plates had both a mix of extremely novel and beautiful lace patterns as well as some lovely dovey imagery of the more traditional western wedding themes. You can read more about it here. Last week MoYou informed us they would also be releasing 3 more plates this Friday from the same collection. Let's take a look shall we? Last week I was very on the fence about these plates and this week has pretty much removed all my doubts. I am not a fan of this collection. Are these plates kittzhy and cute? Yes. Do I think these images would make for a fun mani for a bachlorette party? Yes. Larger images from the smaller plate with a few more quips regarding hen's parties which are essentially bachlorette parties in the UK for those that were a little confused about the hens etc. The one think I will say is that the typography on these plates is gorgeous! They really did a wonderful jobs with the fonts. And again larger images in the XL variety of the smaller plates. I have to admit I find the final fling before the ring image equal parts disturbing and amusing lol. I'm with you on this. Wedding imagery from around the world would have been great! I love the lace plates but that's about it. Hopefully they keep expanding their collection and bring something a bit more versatile in. Yeah hopefully it will end up like the Sci Fi collection. At first I didn't like that one either and then the added some cooler plates which I really liked!